Rating: 1 It's just basic IM using traffic exchanges, an idea that is neither top secret nor profound. The Good: The basic tutorials and lessons might be useful if you're a complete novice to Internet and paid search marketing. The Bad: This program is nothing secret or new, as the sales videos first claim. You will need to shell out extra money for the advertised up-sells and traffic. The Bottom Line: You could give iCloud Commissions a try and see if it will help you grow your website traffic. However, the system does not operate on auto-pilot, and you will be spending a lot of money on its up-sells. But act fast -before head-hunting gurus appear! I found this ludicrous because I refreshed this sales page numerous times in order to quote it accurately. So much for this presentation being live streamed! WHN states that his money-making method has nothing to do with SEO, trading, Clickbank, link building, or binary options. In fact, “I can 100% guarantee you have never seen this method before.” Apparently, this method is how Internet gurus really make their money, and it’s a method they are not about to disclose to the general public. 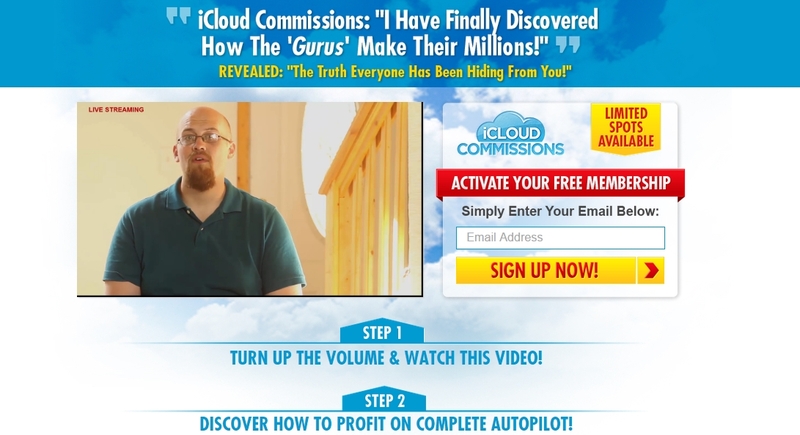 Why is WHN spilling the beans about this super secret method of how the Internet gurus really make their money online? WHN assures you that if you leave this sales page, you won’t be able to come back. That’s funny, because when I clicked out of this page to open it in another browser, I went straight back to the sales video. Once I pass this rigorous test, WHN comes on screen to tell me the real deal. He reveals that the way the gurus make their money is not in selling you their products, which are often free anyway, but in collecting and selling your IP and other personal information. Luckily for you, WHN will not only show you how you can hide your personal information from the iCloud, but how you can even turn the tables on the gurus and make some money yourself. WHN says that this method is completely legal. He also states that this method can make you “thousands of dollars every day on autopilot.” As proof, WHN shows one of his accounts, which earned over $2,000 in just one day. Another one of his accounts, which he also shows, is at over $1,800. WHN keeps stressing how his autopilot method for becoming a millionaire in about two years is top secret. If it’s so secret, why is it being listed on Clicksure? The fact that iCloud Commissions is listed on Clicksure could help explain why there are at least two search results pages filled with “positive” reviews of this product. Also, although the basic commission for affiliates is $30, the affiliates page states that you can make up to $80 in commissions. How do you earn this extra money? I’m suspecting up-sells. Video 1– Hosting: The announcer recommends CoolHandle as a domain name registrar. You are also shown how to get a domain name. You can pick any name for your domain, but the announcer recommends that you pick a name that will make you money. Video 2– Autoresponder: The concept of autoresponse emailing is introduced, and MailMinion is recommended as a possible autoresponder. Video 3– Squeeze page: The idea of a squeeze page is introduced. Lead Pages is mentioned as a great provider of premade squeeze pages. Video 4– Time to make money: PPC (pay per click) advertising through the PaidtoClick network is introduced. HitLeap is also noted as a traffic exchange site you can use to direct traffic to your generated PPC ads. The announcer talks about pausing the click rate at which your ads get clicked on so your account isn’t shut down. Video 5: Generating a serious income: You register accounts similar to PaidtoClick, like Neobux, ClixSense, CashNHits and Paidverts. Then, you send these sites traffic from Hitleap. The warning is reiterated that you need to “warm up” each account before sending massive click traffic; otherwise, your accounts could be closed. Video 6: King of the jungle: You purchase targeted traffic that is directed to your squeeze page. Once you get subscribers, you hit them with emails containing links to Clickbank products. The actual secret to iCloud Commissions involves systematically signing up to PPC platforms, then purchasing and directing traffic streams to your chosen PPC ads. The more traffic you direct to your PPC ads, the greater the likelihood that individuals will click on those ads and generate income for you. To increase your click-through rate, you’ll have to build out your website, generate sales (or squeeze) pages, and add useful content. You’ll also need to generate email marketing campaigns that lead subscribers to your sales pages. Thus, there is really nothing in iCloud Commissions that runs on autopilot. You might get more streamlined traffic to your website by buying premium traffic streams, but you are still in charge of generating interest in your promoted products. That typically includes a lot of content creation and marketing. Furthermore, while traffic exchanges are well-known and used by some Internet marketers, the use of such exchanges has come under the scrutiny of both advertisers and Google. The reason is because many traffic exchanges employ low-paid workers who are compensated on clicks alone. Such exchanges are blamed for wasting millions of dollars in retailer and publisher advertising spend. Many traffic exchange sites enable their members to download an auto-surfer app or other software program. This feature enables members to simply turn on auto-surfing and let it run in the background while they perform other online tasks (or even leave their computer altogether). Thus, while it appears that that there is traffic going to your website, in reality, that traffic may not even be consciously present. Is iCloud Commissions worth the effort? While there is no actual fee to join iCloud Commissions, the program features many up-sells/cross-sells that are integral to generating your “automated income.” You rely on traffic exchanges to generate ad views/clicks, and that traffic is typically purchased. Meanwhile, you risk being penalized by search engines if there is any kind of click fraud detected. 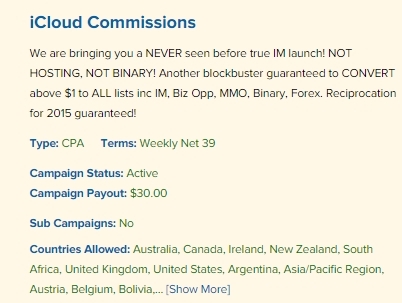 In short, while iCloud Commissions isn’t a scam, it doesn’t exactly provide you with a good method for making a passive online income.